Parlsey has been culitvated for 2,300 years and used in the kitchen. This triple curly leaf parsley is organically grown and comes in a reusable bamboo pot. The very curly leaves of this plant are great used as a garnish or added in small amounts to any dish for extra flavor and color. 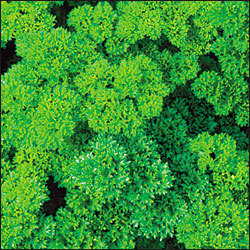 Parsley likes sun and moist well-drained soil. Great as a companion plant to tomatoes and sweet peppers. All of the parsley varieties are high in Vitamins A and C and the minerals, iron and calcium.